If you’ve browsed around our website a little by now, you’ve likely realized that the approach we use to helping you improve your chess game is one of structure. We promote a 7-Skill training model which features important facets of the game and covers everything you need to learn to improve at chess. However, you may be wondering why this method is relevant or important at all, in the first place. Couldn’t you just play as much chess as possible, without reading any theories or memorizing any tactics, and get better at the game? In this article, we’ll discuss why it actually is much more beneficial to train in a structured way than to take on your training in a nonlinear or even random format. First, let’s look at how you might go about learning chess if you decide to do so on your own. You will likely start by just playing some games either against a computer or with friends. If you keep it up, you may even get better and start to recognize patterns or decide on moves you like to make. You’ll probably develop some basic outlines of strategies, whether coming to those conclusions organically or by watching your opponents. If you’re able to find people who are much better than you are, you will probably pick up some lessons from them, or they may even offer to tutor you a little. Players who are even more interested in the game may join a club, and they will likely see some substantial improvement as a result. Surrounding yourself with like-minded and even more skilled people is a great way to improve your own skill set. However, while these types of clubs are great, it’s unlikely that you will be able to meet or attend often enough to improve yourself in the same way that a more structured training model would help you improve. This is fine, and this is in fact the way that most people go about learning chess. The problem here though is that you are very likely to either lose interest or plateau. In the case that you lose interest, this will happen once you either become frustrated at not understanding certain facets of the game or because you’ve lost repeatedly under similar circumstances, or possibly because you just don’t know where to go to improve your skills next. You may not know what areas you need to improve, or you may not even know what areas there are. In the case of your skills plateauing, this can happen when you no longer have more challenging opponents against whom to play, or because you’ve already improved the areas you’re aware of and aren’t sure what to do next. There are many other reasons why you aren’t likely to dedicate the same amount of time to improving your chess game if you use an unstructured training method, but the main reason will likely just be that you won’t be thinking about it as much. If you approach your hobby in a casual manner and without putting in much effort, your mind will likely be occupied with other things, and you won’t spend the same amount of time thinking about chess as you would following a training structure. This is where having a structured method by which to plan your training excels. Using the 7 Skills model presented here, you will always know which areas you need to improve next. Our method is broken down into areas which not only cover all aspects of chess, but also interrelate in a way that will help you build each skill by practicing each of the others. You will quickly see the benefit to this model, since it becomes obvious as soon as you start practicing it. Further, having an overview of all the different aspects of chess will help you keep it in mind, and will likely excite you about the game in ways you haven’t felt before. Many people find themselves thinking about what lessons they want to learn next, which areas they want to train next. You’ll have a frame of reference as you improve your skill. Moreover, using our guided training structure will help you to drastically improve your chess ability at a pace which makes sense for you. If you tire of practicing any one facet, you can always begin to train another and come back to the former at a later time. The training is cyclical, so you will begin to notice how progressive lessons build on the previous lessons, and point toward the skills you have already learned. 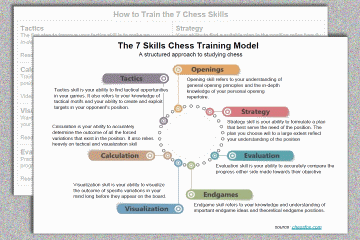 We have put a great deal of effort into creating a training model which can be used by anyone to improve their chess game. We have additionally compiled a large amount of resources which you will be able to reference and memorize so that you can pull them out and use them in your games to come. Additionally, using this structured method will impart a sense of discipline on you which you simply cannot gain through random practice. By holding yourself responsible to the model and keeping in mind the skills you need to practice, you will get better and better at approaching chess as not just a game, but a skill. Your studies will guide you in thinking about the game logically and methodically, and when you play against someone who is either self-taught or hasn’t used any kind of structure, your clear and concise thought process will likely give you a distinct advantage over your opponent. More than anything, practice and diligence is what will help you improve your game. Our goal here is simply to provide you with a method by which you can do that. We have developed the 7 Skills model after spending an immeasurable amount of time trying out other models ourselves, and taking into account their successes and shortcomings. We aim to provide a better way to improve your game, and to do so in a fun and exciting way which will keep you coming back for more. Take a look through our site, get signed up for our newsletter, and most importantly, have fun while you do it.